It’s still early in May but the Yankees have only two remaining starters in the pitching rotation from the Opening Day roster. With the placement of CC Sabathia (knee) on the DL, the two Japanese starters, Hiroki Kuroda and Masahiro Tanaka, are the only remaining starters with Ivan Nova (elbow/Tommy John surgery) and Michael Pineda (back) already on the DL. This means the remainder of the rotation after Kuroda and Tanaka, are David Phelps, Vidal Nuno and perhaps Chase Whitley or Alfredo Aceves. That’s not exactly a rotation that strikes fear in the heart of opposing batters. The Yankees are so very fortunate that they won the Masahiro Tanaka sweepstakes in the off-season. I’d hate to think where this rotation would be without Tanaka. Or the team for that matter. The Yankees will need to do something to address the starting rotation. Nova is gone for the year, and Sabathia is still showing difficulty in adjusting to the latter stages of his pitching career. I am really not sure what to expect when Pineda comes back and Kuroda has not shown consistent dominance since early last year. But with the July trading deadline still over two months away, there are simply no quality options available. Well, at least not at more reasonable prices. Hopefully, someone among the Phelps, Nuno, Whitley et al group step up to show that they belong in The Show. The Yankees need a new starter next year to replace Kuroda, who, more than likely, will retire or return to play in Japan. Rather than vastly overpay for an upcoming free agent, it would be preferable for a young starter in the organization to step up and take his spot (obviously). With Stephen Drew still available and the June draft upcoming, the rumors are picking up again that Drew would be a great fit for the Yankees. I do not disagree. No disrespect for Derek Jeter but he simply is not the player he was once. He will not ride to the sunset like Mariano Rivera at the top of his game. It’s unfortunate, but age has a funny way of doing that to the best of us. I have felt that Drew would be a very solid addition since spring training and better than adding Brian Roberts or Kelly Johnson. I know it would cost a draft pick, but the Yankees should pull the trigger now and sign Drew rather than wait until the competition is much stronger once Drew no longer has compensation tied to his signing following the player draft. Brendan Ryan is a great fielder at shortstop but this team needs quality, clutch bats and Drew would be perhaps the best option for production among the middle infielders if signed. As a Minnesota Vikings fan, I bought into the hype of Johnny Manziel. After experiencing life as a fan of Donnie Baseball, it was appealing to think of my favorite football team being led by Johnny Football. When the Vikings were on the clock at #8 and Manziel was still available, I was hopeful, along with many other Vikings fans apparently, that the team would call his team. But instead, the Vikings swapped places with the Cleveland Browns at #9, and took a defensive player (Anthony Barr). While I recognize the team needed defensive help, particularly the linebackers and defensive backfield, but the team needs a true leader. I had been hopeful Christian Ponder would be the guy but it has never worked out. Perhaps offensive coordinator Norv Turner can pull something out of Ponder but in many ways it is too late. Matt Cassell will be the starter in 2014 barring injury, so it was a given the Vikings would take a QB in the draft. After failing to trade up to #22 (the Philadelphia Eagles accepted a better offer from the Cleveland Browns who then took Johnny Football), the Vikings traded back up into the first round (last pick at #32) with the Seattle Seahawks and grabbed the guy who was number one on many top QB lists, Teddy Bridgewater. So, while I was disappointed the Vikings didn’t get Manziel, it is certainly not difficult to be excited about the potential of Bridgewater. He’ll have great weapons with Adrian Peterson, Cordarelle Patterson, Kyle Rudolph, Greg Jennings and others. Ponder now becomes an afterthought, unless he is somehow able to find his way back into the starter’s role before Bridgewater takes the position for good. Since the games are being held in the Bronx, I suppose the Boston Red Sox kill of any Yankee play-off aspirations should be called the Bronx Massacre. Unfortunately, the high hopes coming off the sweep of the Chicago White Sox were dashed as the Sox are definitely now on the other foot. Thursday’s game was disappointing as the Yankees launched a valiant rally only to lose a game they were within one strike of winning. The defeat came with none other than the legendary Mariano Rivera on the mound. Friday night, it was the Yankees who built the large early lead, but the Red Sox stormed back and thrashed the Yankees. Although Boone Logan gave up the key grand slam, I blame Phil Hughes for changing the momentum of the game. Today’s game (Saturday) is still underway but the team is getting royally throttled at the moment (12-3 in the 5th inning). The Yankee pitching staff has not shown the ability to get Red Sox hitters out during this series so I have no reason to expect the team to rally from the latest hole (either today’s game or the season). If they lose today’s game as expected, they’ll be 11 games behind the Red Sox in the AL East standings. The races for the Wild Card spots are still within reach but the Yankees aren’t playing like a team that wants to win. They still have one more series against the Red Sox (in Boston) and if they can’t beat the Sox in the Bronx, they certainly are not going to win in Beantown. This has been a very weird season as a Yankees fan. The team did nothing to improve upon last year’s squad and simply filled key roles with bargain basement replacements. Alfonso Soriano is the only quality acquisition, but he is an aging player with a large salary. It’s not exactly like it was a brilliant acquisition for GM Brian Cashman. The Chicago Cubs were glad to part with Soriano even if they are still picking up a large part of his compensation. I’ve been reading many articles that talk about the great managing job Joe Girardi has done this season, but no one is saying the same about Cashman. The unknown variable is that we do not know the restraints he is under from Managing General Partner Hal Steinbrenner. If you are under standing orders that you cannot increase salary, it’s not exactly like you are going to go out and land a Giancarlo Stanton or Cliff Lee. But it’s odd watching the Pittsburgh Pirates being more aggressive in the addition of reinforcements (i.e., Justin Morneau, Marlon Byrd and John Buck) than the Yankees. A few key “stronger” players here or there could have meant the difference in the current Wild Card standings and the Yankees wouldn’t be on the outside looking in. The only guarantee is that there will be changes in the off-season. At this point, I have to believe that the departure of Cashman is a possibility. I do not expect Joe Girardi to be going anywhere but this team will look radically different, particularly if the Yankees do not re-sign impending free agent Robinson Cano. I am not sure what to expect with the 2014 Yankees. I don’t know if optimism will be part of the equation and if we will be looking at another “patched-together” squad of expensive, deteriorating older players and cheap free agent acquisitions of players released from their current clubs. The Yankees need to get younger but is this going to take a season or two, or years. The decisions being made by Hal Steinbrenner will impact the Yankees for years to come. Time will tell if he is making very astute and winning decisions to set up future success, or if he is ensuring that this time period will be the 1980’s re-visited. If somehow the Yankees manage to salvage the 2013 season and grabbed a Wild Card spot, I seriously doubt they’d be able to do anything with it. Hopefully, the Steinbrenner family is able to do something to return optimism to the Bronx in the not-so-distant future. As a long-suffering Minnesota Vikings fan, the hope is that this is the year QB Christian Ponder “figures it out”. He is a talented and intelligent guy, and there’s no reason for him not to become the answer for the Vikings if he chooses to be. How many guys would like to have Adrian Peterson in the backfield, Greg Jennings out wide, and Kyle Rudolph at tight end? Ponder has the weapons and he has the physical tools to succeed. It is all up to him. If the Vikings have to make the move to replace Ponder with backup Matt Cassel, then the team is sunk. Last year was a pleasant surprise but it will be more challenging this year with the more difficult schedule. I do wish that Adrian Peterson would let go of the dream to reach 2,500 rushing yards in a season. I would not want to see him at such risk for injury nor would I want an individual goal to become superior to the team’s goals. Soon, the San Jose Sharks will join the Minnesota Vikings as “distractions” for me during this disappointing MLB campaign. I am looking forward to a full season of NHL Hockey rather than last year’s strike-shortened version. I am still having a tough time thinking of the HP Pavilion or “Shark Tank” as the SAP Center. While it is called S-A-P and not the word “sap”, how long before the latter becomes the norm if the team fails to succeed? About 20 games into the season and the Yankees are barely closer to first place than they are last place. Only two games separate the Yankees from the dismal start by the Boston Red Sox but of course the Sox are playing better as of late. It’s only April so at this point, the standings don’t really mean too much as the superior AL East teams will begin to separate themselves from the pretenders over the course of the next couple of months. It was nice to see the Yankees pull off a walk-off win at Yankee Stadium last night against the team that seems to terrorize them in the play-offs in recent years, the Detroit Tigers. I am really surprised that Justin Verlander holds an 0-2 mark with 4.50 ERA for his career at the new Yankee Stadium. When he is on the mound, it is hard not to expect bad things for the home team. So, regardless of Verlander’s struggles at Yankee Stadium, it is still a great feeling to pick up a win on a night when he took the mound. Lately, there have been numerous columns and articles written about how disastrous the Yankees trade for Michael Pineda has become. I realize that he’s lost for the season due to his shoulder injury, but he is still a young and talented pitcher. I know there’s always a risk that he isn’t quite the pitcher was projected to be when he comes back, but I think it’s way too early to criticize the trade which sent talented hitter Jesus Montero to Seattle. Pineda’s injury was suffered on the Yankees’ watch and not while he was in Seattle, and there is still a good chance that he’s a strong, contributing part of next year’s rotation. Phil Hughes is probably the beneficiary of Pineda’s injury as I feel that Freddy Garcia will be the odd man out when Andy Pettitte returns to the Bronx. Hughes hasn’t exactly pitched like he wants to stay, but I am not ready to see the Yankees banish him to Pittsburgh or someplace like that. Maybe I am an eternal optimist but I still believe that Hughes can prosper in New York. I am a bit concerned by the uneven starts provided by new Yankee Hiroki Kuroda, but I think he’ll settle in and deliver consistent performances in the coming weeks and months. Yes, I do thank the lucky stars every day for CC Sabathia. I was saddened to hear the passing of Yankees great Bill “Moose” Skowron yesterday. He was part of the 1961 Yankees which will always be a special team in Yankees history for the famed M&M Boys (the year Mickey Mantle hit 54 home runs, and Roger Maris hit the then record 61 homers). But there’s no way either Mickey or Roger could have reached those heights without guys like Skowron on the roster. Well, the Bryce Harper Show begins its maiden tour in Washington with the scheduled first start today for the ultra-hyped, super prospect National. Given that he was called up to take the roster spot of injured 3B Ryan Zimmerman, there’s always the chance that Harper goes back down when Zimmerman returns from the DL. But if Harper starts to hit like we know he will, it will be hard for the Nats to remove him from the roster. It will be interesting to see how this plays out. America loves superstars and Harper certainly has as much of a chance to be the best as anyone in the game today. It’s only been three rounds, but I am pleased with the NFL draft selections made by the Minnesota Vikings. Prior to the draft, my preference for the Vikings #3 pick in the first round was USC OT Matt Kalil. There was talk that the Vikings were undecided among Kalil, CB Morris Claiborne, and WR Justin Blackmon, but in the end, it proved to be a smokescreen. I was a bit anxious when I first heard the Vikings had traded down with the Cleveland Browns, but it was clear that the Browns were going after RB Trent Richardson so there was no risk of losing Kalil off the board. At first, I didn’t understand the logic of the move, but clearly the Vikings (and GM Rick Spielman) had made the Browns fearful they’d trade down with another team which could potentially cost the Browns a shot at the premier running back in the draft. The move brought three late round picks to the Vikings and it didn’t cost them anything as they were focused on Kalil from the start. I also like the Vikings’ subsequent picks (late first round selection of S Harrison Smith and early third round choice of speedy CB Josh Robinson). For a team that was desperate of upgrades in the secondary, they fared well. It would have been nice if Robinson were a bit taller, but his 4.33 speed at the Combines was unmatched. I think he’s good material for the coaching staff to mold for playing at this level. The Vikings have a plethora of selections today as Rounds 4-7 are completed, and I am sure that the defense will continue to get attention. I also expect the Vikings to choose a wide receiver, but I have no idea who they might target. Nevertheless, with Spielman’s decisions so far, I have no doubt that he’ll continue to bring talented playmakers to Minnesota. Today, with Yankees-Tigers on tap and the conclusion of the NFL Draft, will be a fun day. Enjoy! The game saw the ejections of Alex Rodriguez and Joe Girardi. A-Rod took a called third strike to end the fourth inning with the bases loaded. He felt that the pitch was outside. He continued jawing with the umpire, Marty Foster, about the call, particularly after watching a video replay following the top of the 5th which confirmed his belief that the pitch was outside. Foster finally had enough and tossed A-Rod and then Manager Joe Girardi, who argued very animatedly the umpire. 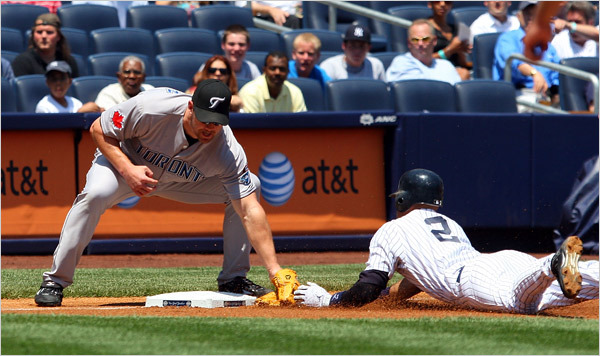 There is bad blood between the Yankees and Foster, who also made a bad call on Derek Jeter in July. Eric Hinske took over for A-Rod at third after the ejection, but fortunately, it worked out in the end. Thanks to an 8-run 8th, which included a three-run homer by Matsui, the Yankees put this one away and assured a return to the win column. Nonetheless, they will still lose a ½ game to the Boston Red Sox, who swept the Tampa Bay Rays today. The Yankees now lead Boston by 7 games. How sad is it that the Rays have now lost 11 straight games? The magic of 2008 is definitely gone. The Yankees’ lead over the Los Angeles Angels for best record in the league stands at 5 games. This is an interesting week schedule-wise. The Yankees will play one game against the Los Angeles Angels on Monday. This is a make-up of the May 3rd rainout at Yankee Stadium. I remember that day well considering that I was in attendance at Yankee Stadium. I won’t be able to take advantage of my ticket tomorrow since I’ve since relocated from the East Coast to California, but I’ll definitely be there in spirit. The last time the Yankees faced the Angels, they were swept (final series before the All-Star Break). This is just one game, but the Yankees have a chance to make a statement against the Angels. 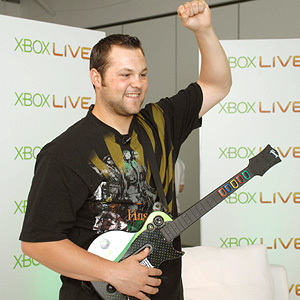 Joba Chamberlain (8-5) faces Jered Weaver (15-5). Then, the Yankees close out the home stand with two games against the Toronto Blue Jays. 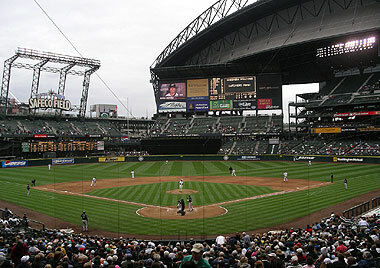 They travel across the country on Thursday to open a three-game weekend series in Seattle against the Mariners. Congratulations to Brett Favre for his first victory with the Minnesota Vikings. The Vikings defeated the Cleveland Browns and Favre’s former coach, Eric Mangini, 34-20, on Sunday. His stats weren’t great (14-for-21, 110 yards, 1 TD), but when you have Adrian Peterson in your backfield running for 180 yards and 3 TD’s, there’s not much you need to do.